At first glance, the question Violinist.com reader Timothy Weston posted January 20 looked like hundreds of other similar questions we get on Violinist.com: How do I find my first violin, on a budget? How can I learn to play, with no access to a teacher? How might the weather where I live affect the violin? Except this was different. The weather he was talking about: extreme temperatures and humidity, plus sand. Lots of sand. You see, what U.S. soldier Timothy Weston was really asking was: "How can I get started on the violin, in the middle of a war zone?" The idea of playing the violin didn't come completely out of the blue for Timothy, who has been serving in Iraq since September, his wife Carissa said. "He really likes classical music," she said. "When he was younger, he would drive down the street with an eight-inch Mohawk, blaring Mozart." Carissa and Timothy met in early 2006. He joined the army in June of that year, and they were married in October, after which they moved to an Army base in Alaska. Timothy had been talking for several years about playing an instrument, trying to decide which one, Carissa said. He grew curious about the violin when he met a soldier in his unit whose wife played the violin. "Once he gets something in his head that he wants to do, he does it," Carissa said. "He was researching on every website about the violin." During one of their long-distance conversations, he mentioned that he'd like to buy a violin, and that violins eBay ranged from $40 to $400. It seemed like a lot. "Unfortunately military income is not good," Carissa said. She gave him a budget of $200, and told him to be wary of eBay, to do the best he could to get a quality instrument. When he posted on Violinist.com, "he was basically trying to get advice on what he could buy for what I had budgeted him," she said. It didn't take long for V.com members to notice Timothy's post. 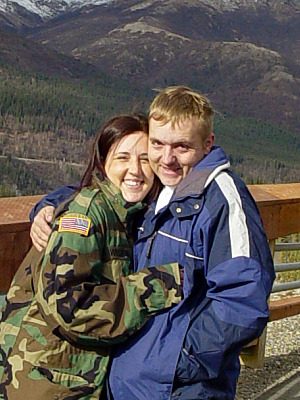 "Thank you for serving in Iraq," said V.com member Valerie VanOsdale, "I hope you will be able to come home soon. I'll be wishing you my best for safety and good health." One post later, David Burgess offered to chip in $50 to help Timothy get a violin, and that got the ball rolling. People started offering to donate: $20 here, $10 there. "I was a Military Policeman in Vietnam," said Joe Fischer. "Count me in for a 10 spot....I live on $614 per month, else I'd give more." V.com member Ihnsouk Guim offered to donate her daughter's violin, a William Lewis and son, along with a Freistat case and a Glasser bow. V.com member Ken McKay set up a Paypal button for taking donations. Within one day, plans were well in the works, with Burgess coordinating the efforts. Guim would send his violin, and luthier and former Marine, Peter Lynch, agreed to donate any work that was needed to set up the violin. And the ball just kept rolling: Bowmaker Josh Henry donated a carbon fiber bow. McKay procured a Suspensionair case, and Elinor Estepa donated a Kun shoulder rest, Salchow rosin, a set of Evah Pirazzi strings, the book "Essential Elements for Strings", and a practice mute. Al Ku sent Wohlfahrt and scores, and I sent some method books. Weston was amazed. He called me, then wrote to me the day after his first post: "I would just like to find out how I could get some of your members recognized. I am not sure if you are aware of how my first discussion post went, it took a turn that I never expected... "
Well, Weston did receive his violin, around the beginning of March. "The violin has arrived," Weston wrote to me on March 7. " I have had it for just over a week. I have thrown myself into learning how to play. I would love to send you a picture of myself and my violin though the Internet here is really slow, and our personal Internet hasn't come online yet...Thank you so much for, everything. I will most definitely post any questions that I have." Just a month and a half into his deployment, Weston's unit came under mortar fire and lost two soldiers, with 10 others suffering minor injuries. "He was 20 feet away when it happened," Carissa said. As a driver, he was not permitted to exit his vehicle. It's hard to talk about these kinds of things when they happen, Carissa said, but "if he wants to talk about his violin, I listen all day long," she said. "I think it gives him a piece of home, a peace of mind." The good news is that in the next few weeks, Weston should be coming home to his in-laws place in Lawrenceburg, Indiana (near Cincinnati) for an R and R break. He'll be fully loaded down: he plans to take his fiddle on leave with him, and to take a few lessons from a music director at church. They may even trek up to Ann Arbor to see Burgess. Despite the fact that she is in constant contact with Timothy, "I can't fathom what they go through," Carissa said. "But I know that when he's been playing his violin or reading about it, he's really excited when he talks about it with me. I appreciate what he does, but I didn't expect the rest of America feels that way. This has been wonderful." "When you live on an Army base, you kind of lose sight of the fact that people outside the Army appreciate what you do," Carissa said. "I was in tears, seeing how much people were willing to do, – I couldn't even come up with the words to say thank you." So allow me to say thank you to all who donated money, instruments, music and services and more in this effort: David Burgess, Peter Lynch, Ihnsouk Guim, Ken McKay, Josh Henry, Elinor Estepa, Robert MacPherson, Kevin Kelly, Francis Roux, Smiley Hsu, Ann Miller, Christopher Norton, Conrad Thomas, Joseph Fisher, Laura Zmolk, Rea-ann Heinrich, Gabrien Schaff, Sharon Katzmann, Sharelle Taylor, Bart Meijer, Al Ku, and a number of anonymous donors and helpers. After the purchases and mailing expenses, we were left with a $223 surplus in donations. After taking in suggestions and doing some research and consulting with David Burgess, I propose that we send this money to Operation Happy Note. This is a small charity, started in 2005 by Steve and Barb Baker of Fergus Falls, Minnesota, after their son was deployed to Iraq. They sent a guitar to their son, then one to his buddy, and since then have set up a charitable organization and website and that accepts both requests for instruments from soldiers and donations (monetary and instruments) from the public. I've watched from the beginning as this little drama began to unfold. This is a bright spot in a sometimes dismal world. It makes me proud to be a vcommie! That is an incredible story! Music can be a bright light in so many ways! Not only will this help him, but those of his buddies as well! I'm all choked up now. My 17yo son enlisted with the Marines on 9/11 of 2008. He played violin as a 4-8 year old and had absolutely beautiful tone, which I will never forget. A HUGE thank you to all of you who helped this soldier. It's wonderful to see people joining together to help someone they've never even met. Thanks for sharing the details on this, Laurie! Something useful is done with the rest of the money -- I'm all for it. But, guitars? May they all come home safely. Operation Happy Note is a perfect place to send the rest of the money---thanks for finding out about that, Laurie. They should let us know if any other soldiers ask them for a violin. That's an amazing thing to think we gave a soldier in a war zone some peace of mind. I hope Timothy takes good care of himself and comes home safe, so he can be with his family, and take real violin lessons! As the wife of a retired Air Force veteran, I want to thank you, Laurie, for posting this. 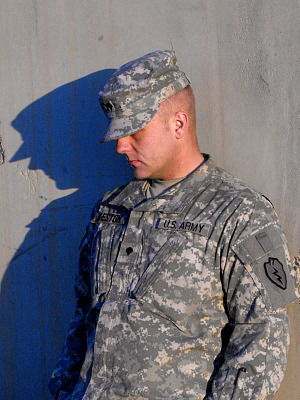 Sometimes serving in the military can feel like a thankless job; even if the service member is not deployed into a war-zone, long hours, low pay, time away from family and friends, and occasionally the hostility of the media and of some members of the community can be very demoralizing. Anything like this is greatly appreciated by members of the military. I can't help thinking this is a real appropriate example of the "American Way," for which sake they agree to go in the first place, ultimately. Gifts given out of abundance, out of free will, with the only expectation being fostering more of the same. Incidentally, my little brother recently returned from Iraq, glad to be back, and all's well. Please find ways to contribute to others, not always for monetary remuneration. This is not only a proven way to happiness and joy, but in my possibly naive semi-religious construct, it results in blessings to the giver. Oh, wow! I've also not been spending as much time on the site as I used to...thanks for calling attention to what happened. This is a truly inspiring story. Me too, I missed this when it was happening. Such a neat story. Thanks for the article! This is really great and makes me proud to be a member of the site!! I only wish I had read about this sooner to donate something! I hope he will come home safely soon and enjoy his violin studies! Laurie, thanks. This is probably the most important thing the site is doing. I somehow missed the original request or I would have given him a set myself. This is one of the places where having a shop helps. If any more of these come, I will gladly take care of them if at all possible through the shop and if not possible I'll be part of the effort. Thanks for taking it so seriously. Feel free to contact me for help in this area. Good Morning, Laurie. When I got the first E-Mail, from Timothy's Wife, My Daughter-in-Law, I was so excited. I had no personal Knowledge that he was at an end, and wanted to learn about the Violin. When I read the Artical about him, Iwas so, inspired, that it brought out a lot of Emotions I didn't realize I had. I want to Personally Thank You, and everyone, that has helped in any way, to make this come true, for one of our Defenders, of this Fine Country. Being a former sailor, myself, Iknow something about being away from, Family and friends, for extended periods of time. You have turned into a fan of mine, and I truely Hope you do well, in what you do yourself. Laurie, Thank You again, for making a Proud Father of me, and should I, be able to do anything for anyone, Just Please let me Know. Tim Weston, Father of Timothy our US Soldier.